2004 Topps Star Wars Heritage trading cards are notable for a couple of reasons. It's the first set to include cards from all six theatrical films. 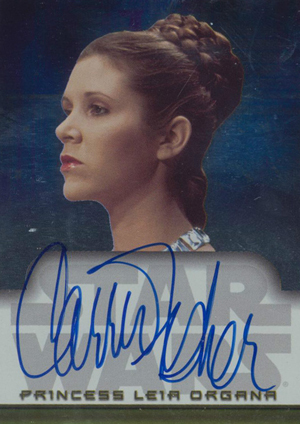 It offered collectors the first pack-inserted Mark Hamill autographs. Finally, and most importantly, it's the first set of Star Wars cards to offer sketch cards from the original trilogy. The 120-card checklist is largely spread across the original trilogy and the first two prequels. 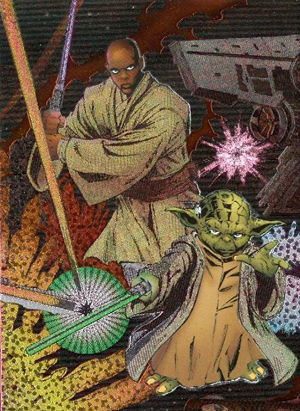 Released shortly before Episode III hit theaters, the final movie has a handful of preview cards towards the end of the set. The base set design is based on the classic sets from the original trilogy. 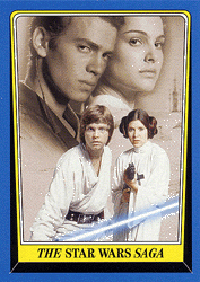 A New Hope and The Phantom Menace use look of the 1977 Topps Star Wars sets. The Empire Strikes Back and Attack of the Clones take a page from the original 1980 Topps Empire Strikes Back releases. The final films share the design of 1983 Topps Return of the Jedi. Not only do the cards maintain the old designs, but also the card stock, as well. Packs also came with a piece of gum (wrapped separately to avoid wax stains). 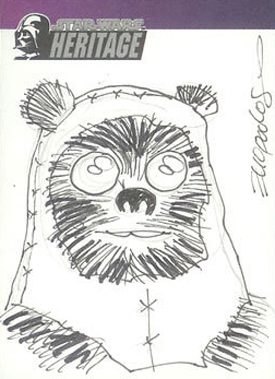 One of the keys to 2004 Topps Star Wars Heritage are the sketch cards. Although there were sketches for the franchise before this set, they came in a set dedicated to the series of Clone Wars short cartoons. This is the first set to have sketch cards from the films themselves. Artists were given a lot of freedom as far as characters and styles. When the set was produced, the standards for sketch cards were lower. Simple pencil sketches were the norm in the industry. While there are many that use a high degree of detail and color, they are certainly the exception in this set and usually command a premium. This site features scans from all of the different artists. 2004 Topps Star Wars Heritage has a trio of autograph cards from key actors in the film. Mark Hamill (Luke Skywalker), Carrie Fisher (Princess Leia) and James Earl Jones (voice of Darth Vader) all signed for the set. Not only is this Hamill's first certified autograph card, but it's also extremely rare. As a result, prices for the card remain especially high. In something of a strange turn, 2004 Topps Star Wars Heritage hobby boxes came in two waves. While the overall product is identical, there are some subtle differences. Sketch card artists differ between the two releases. Many artists are in both, but the insertion rate of their particular cards can vary. The other main difference is in the Etched-Foil inserts. Both waves have a different six-card puzzle. Second wave boxes are noted on top with a yellow explosion that says, "Includes New Sketch Card Artists & New Etched-Foil Puzzle." 2004 Topps Star Wars Heritage also has retail packs and boxes. They don't have sketch cards or autographs. However, there is a retail-exclusive set of stickers. 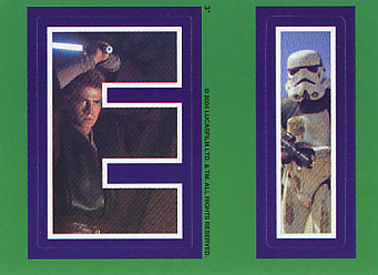 Mimicking the alphabet-style stickers found in 1980 Topps Empire Strikes Back, the 30-card set is relatively tough to complete. Considering they fall one in three retail packs, they still sell for solid amounts. Fisher inserted 1:2963 Wave 1 packs, 1:2966 Wave 2 packs. Hamill inserted 1:6,824 Wave 1, 1:6,980 Wave 2. Jones inserted 1:802 Wave 1, 1:809 Wave 2. 6 cards per Wave. Each Wave has a different puzzle. Wave 1 inserted 1:9 hobby packs, 1:6 retail packs. Wave 2 inserted 1:9 hobby packs. Exclusive to cases distributed in the UK.